Here are the famous red-haired twin boys who were at one time the stars of the "Flying Allens" balloon ascension act. On the left is Edward B Allen, better known as Bill and later in life as "Captain Eddie Allen". 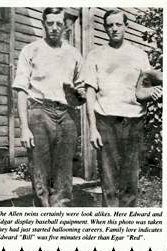 Edgar "Red" Allen is on the right. The twin boys were born to Comfort and Mary Anna Larred/Laird Allen on the 2nd day of August in 1896. They also had an older son, Warren "Speck" who performed with his uncles, Ira and Martin. Click to view Edgar "Red" Allen's genealogy!